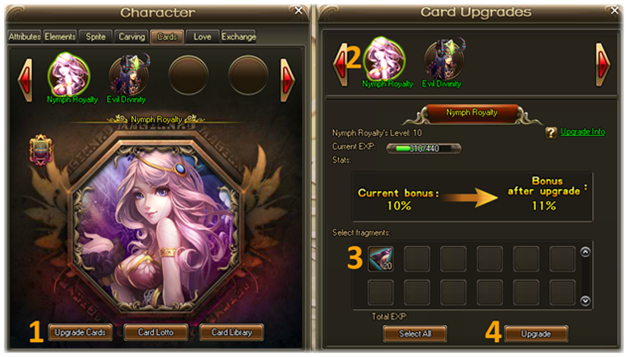 Unlocked at level 68, collect and activate various card fragments to improve your Battle Rating and character’s stats! There are currently two types of cards: Nymph Royalty (aka Nymph Queen), and Evil Divinity (aka Demon Lord). Magic Cards can be accessed by opening your Character panel and clicking “Cards”. Nymph Queen card fragments can be obtained from the Card Lotto Slot Machine. Open your Character panel, click “Cards”, and then the “Card Lotto” button to open the slot machine. Playing the slots requires Lucky Coins, which can be bought from the Daily section of the Shop, the VIP Shop, or the Cross-server Badge Exchange. Each play will guarantee you at least a card fragment or more Lucky Coins! Demon Lord fragments are obtained from Card Packs, which are synthesized in the Magic Cards section of the Forge. To synthesize a card pack, you’ll need to collect Magic Cards, available as a drop in L7 of Demonhunt. Note that you will not get cards if you blitz the level. 1. Double-click a fragment in your inventory to activate. If you don’t already have the fragment in your card library, it will be added there. 2. Duplicate fragments will not be added to your card library, but are instead used to upgrade your cards. Click “Upgrade Cards” to see all the duplicate fragments you’ve activated. 3. You can drag fragments from the library to the main panel to equip. Cards come in four qualities including uncommon, rare, epic, and legendary. Collect and equip all 8 fragments of a color and get a set bonus! Duplicate fragments, for example 2 activated uncommon Nymph Queen Fragment #6, are used to upgrade your cards. 1. From the “Cards” window, click “Upgrade Cards”. 2. Select the card you want to upgrade. 3. Select the fragments you want to use. Note that fragments used for upgrading will be permanently consumed!